Pakistan has ordered a review of all co-operation with the US and Nato after the alliance struck a Pakistani army checkpoint, killing at least 24 people. A committee chaired by Prime Minister Yousuf Raza Gilani also decided to cut supply lines to Nato in Afghanistan. A Nato spokesman admitted it was "highly likely" that Nato aircraft were behind the strike at the Afghan border. The US has stressed the importance of its relationship and said it fully backed Nato's plan to investigate. Nato's Brig Gen Carsten Jacobson sent condolences to Pakistan and said the alliance was investigating how the incident occurred. Mr Gilani called the attack a "grave infringement of Pakistan's sovereignty". The BBC's Orla Guerin in Islamabad says this could be a very costly mistake by Nato, which relies heavily on the route through Pakistan to supply its personnel involved in the war in Afghanistan. A meeting of the cabinet's defence committee, convened by Mr Gilani, decided the government would "revisit and undertake a complete review of all programmes, activities and co-operative arrangements with US/Nato/Isaf, including diplomatic, political, military and intelligence". There is a lot of anger in Pakistan at what has happened. Anti-American feeling among the general public is high normally, and these kinds of incidents increase that feeling. There is anger also because, unlike similar incidents in the past, there has been no explanation yet of what happened. For the moment, Pakistan has suspended supply lines into Afghanistan and asked the US to vacate the air base from where it has in the past launched drone strikes against tribal areas. In addition, Pakistan has also indicated that it may carry out a wider review of its relationship with the US and Nato, covering intelligence sharing and diplomatic ties etc. It "decided to close with immediate effect Nato/Isaf logistics supply lines", according to a statement issued by Mr Gilani's office. 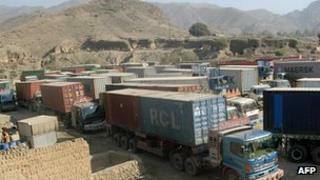 Reports appeared to confirm that Nato traffic was not being allowed through Pakistan's two border crossings with Afghanistan, at Torkham and Chaman. The committee also said the United States would be asked to vacate, within 15 days, the Shamsi air base, which the US has used to launch drones. However, our correspondent notes that Pakistan has made a similar demand before and the base may already be empty. Pakistan's government also summoned the US ambassador. Late on Saturday, US Secretary of Defense Leon Panetta and Secretary of State Hillary Clinton released a statement saying they offered their "deepest condolences for the loss of life and support fully Nato's intention to investigate immediately". They stressed the "importance of the US-Pakistani partnership, which serves the mutual interests of our people" and pledged to remain in close contact with their Pakistani counterparts, the AFP news agency quoted the statement as saying. Pakistani officials said there had been no militant activity in the area, and most of the Pakistani soldiers were asleep. They also said Nato had the grid references of the posts and therefore should not have fired. Gen Jacobson said a combined force of Afghan and Nato troops were in the area when "a tactical situation developed on the ground", though he gave no more details. He said close air support was called in, and "we're aware it's highly likely this caused casualties". Military sources told the BBC's Quentin Sommerville in Paktika province in Afghanistan that a US-Afghan special forces mission had been in the area, where they believed a Taliban training camp was operating. In a statement, Isaf commander Gen John R Allen said the incident "has my highest personal attention and my commitment to thoroughly investigate it to determine the facts". The incident looks set to deal a fresh blow to US-Pakistan relations, which had only just begun to recover following a unilateral US raid that killed Osama Bin Laden in Pakistan in May. Pakistani troops are involved in fighting the Taliban in the crucial border region area. Hundreds of militants have been resisting attempts by the security forces to clear them from southern and south-eastern parts of the district. In October, Pakistan's army chief Ashfaq Kayani warned the US against taking unilateral action in nearby North Waziristan. Washington has for many years urged Islamabad to deal with militants in the area.